More American voters approve of the Affordable Care Act now than they ever did under the previous administration, which enacted the law — even as support is slipping for the GOP alternative that Republicans are now shepherding through Congress. A new Morning Consult/POLITICO poll shows that 50 percent of voters strongly or somewhat approve of Obamacare, while 42 percent disapprove of the 2010 health law. 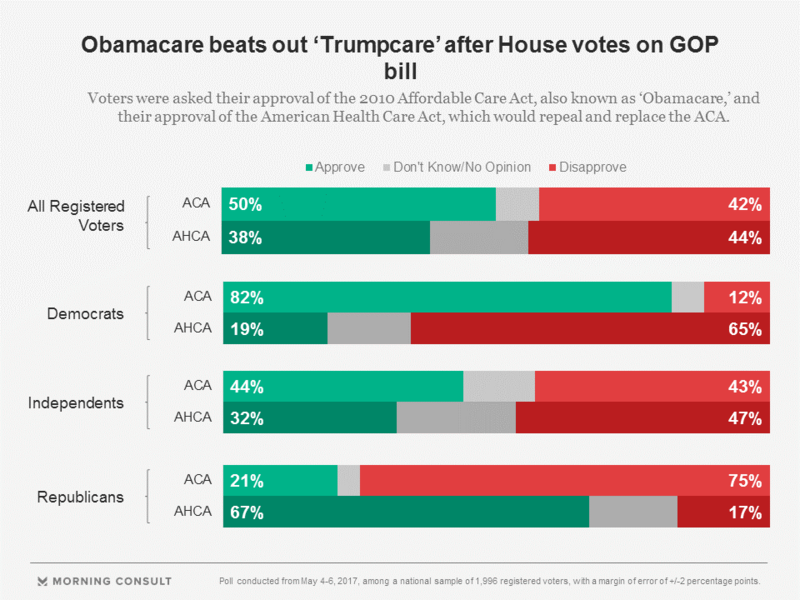 On the other hand, 38 percent of voters say they approve of the American Health Care Act, versus 44 percent who disapprove of the GOP measure meant to replace the ACA. House Republicans narrowly passed an overhaul of the individual health insurance market May 4, though their Senate counterparts plan to slow down to craft their own measure. GOP senators have indicated they’re not seeking to craft a bipartisan measure: A 13-member working group focused on health care includes only Republicans. A plurality of voters, 41 percent, say they think the Republican-backed legislation would make the health care system worse, while 26 percent believe it would make the system better. And many of Obamacare’s provisions are also more popular than their Republican alternatives, the data shows. For example, 52 percent of voters support eliminating the ACA’s individual mandate, which requires people to buy insurance or pay a fine. But 63 percent of voters oppose the provision of the AHCA that also tries to encourage people to buy insurance by levying a 30-percent penalty on premium costs if their coverage lapses for more than two months. Just 16 percent of respondents said they support that provision. When asked to choose the form of tax credits to help people afford health insurance, 55 percent of voters said they support based credits on people’s income and location — which is how Obamacare’s subsidies are calculated. In contrast, 18 percent of voters supported basing credits on age, as proposed in the GOP alternative. In fact, the AHCA retains Obamacare’s guaranteed issue, which says an insurer cannot deny a policy to an individual with a pre-existing condition. But health policy experts say sick patients who don’t keep continuous coverage could still be priced out of the market if they live in a state that opts out of the ACA provision that prohibits insurers from charging sick people more than healthy people. Treatment of pre-existing conditions became a major sticking point in the days leading up to the House vote on the AHCA, and leaders managed to get final votes by adding $8 billion to help defray health costs for sicker Americans in states that are allowed to opt out of certain consumer protections. As the Senate takes on its own version of the health care bill, the treatment of Medicaid expansion could become another contentious issue within the Republican Conference. Under the AHCA, states that expanded Medicaid could enroll eligible beneficiaries until 2020, when enrollment would return to more limited rules under traditional Medicaid. That proposal enjoys some support: Forty-four percent of voters said they favored allowing people to continue enrolling in Medicaid until 2020, at which point enrollment would become more limited, compared with 28 percent who said they opposed the proposal and 28 percent who said they didn’t know. The national, online survey of 1,996 registered voters was conducted May 4 through May 6 and has a margin of error of plus or minus 2 percentage points. See the full results here.